In this webinar, we are bringing together the facilitators of the Belbin Masterclass session on one platform. With Steve Correa, Stephen Chinnaswamy & Pearl D’Souza, this is going to be a power packed learning session and we would love you to be part of it! We want to truly make sure that you have key take-aways from the time that you spend on the webinar so look out for a worksheet and reference sheet that will make the learning process more interactive and experiential. You will receive the same on registering for the webinar. Steve Correa: Steve has over 30+years of corporate experience, 18+ years of which have been at the Senior Leadership Levels (CXO) in organisations such as Diageo, Vodafone, Reliance Jio, Patni Computers. Steve is an accredited Belbin Practitioner and has strongly leveraged Belbin for talent management. Stephen Chinnaswamy: Stephen has 34+ yrs of hard-core industrial Sales, Marketing and Business Development experience. He has worked with organisations across sectors such as: Airtel, Axis Bank, Blue Dart Aviation Ltd., BPCL, Crompton Greaves, ELCOT – Govt. of Tamil Nadu. Stephen is an accredited Belbin Practitioner and has enabled lasting changes leveraging Belbin for individuals and teams. Pearl D’souza: Pearl has led wide scale Belbin Implementation Projects in organisations such as – Tata Business Excellence Group, Chola Mandalam Finance, Emcure Pharmaceuticals, APM Terminals. 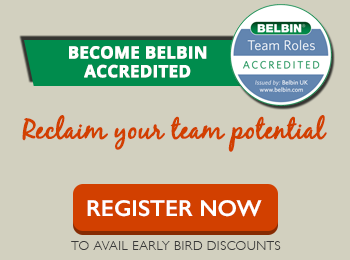 She is a Belbin accreditation course provider in India. Her research papers and presentations have been part of national and international forums and conferences. As leaders, knowing our stakeholders and building a relationship of collaboration is important to attain collective organization goals. In this webinar we have the opportunity to speak with Mr. PG Suresh Kumar who has earned the unique portfolio of leading both line and people function. PG Suresh Kumar is Head HR at L&T IDPL and is also the Business Head for Transmission Lines at L&T IDPL. His business sense, strength of project management and keen focus on people and development have enabled him to truly focus on business and people. Three key elements of stake holder collaboration. The role of the growth mindset and its influence. With the future of work changing, collaboration today is a key competency for leaders and team members to possess. Technology is changing the way we work. In an everchanging work environment with industry uncertainties, creating new opportunities requires that we work together. Collaboration is a must not only to thrive but to survive! We are delighted to have Shalu Manan, Global Capability Development Leader for Transformation Services business at Genpact join us on this webinar. I have worked with Shalu and every conversation always enables deeper insight and new areas to explore. Her passion and commitment to talent development, culture, performance and really brining about on the ground impact shines through! We would be delighted for you to join us Please do block your time.Would be great if you can join us. Please do block your time. 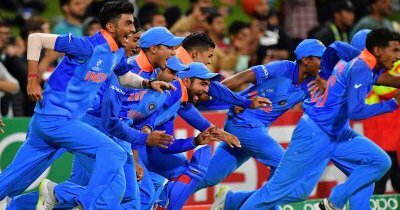 The euphoric and historic win by the U19 team gave Indians cause for celebration and joy. The future of Indian cricket is indeed bright. Coming from the behavioral sciences space, there were three aspects that caught my attention. In industry today when so many organizations are struggling with the problem of working in silos and low trust levels, this is an important pearl of wisdom from the maestro himself. We need to get down to the ‘how’ of teamwork. India is on the brink of making a strong mark. We’ve got the world looking at us, in a way may I say the world is wanting to woo us. We are in the best place to dream big and make it a reality. Let’s get down to getting the art and science of teamwork right. 2) Rahul Dravid sharing his thoughts after the win. Dravid gave credit to the support staff and the boys- great insight into his leadership style. His hope that the memory of a junior World Cup win won’t define careers of his team but they go on to create bigger and better memories for themselves is inspiring. A leader who wants his team to enjoy this big victory but really wanting them to truly discover and maximize their potential. Being aware that he attracts quite a bit of attention but refocusing it on the support staff and the team- a reminder of how important emotional intelligence is for a leader today. Daniel Goleman speaks of self-awareness, self-regulation, motivation, empathy and connecting with people as being core to emotional intelligence. In a world where media can truly command who gets attention, Dravid for me reminded me of the need to be self-aware, self-regulated and to put the team first. A news channel was speaking of this and I thought it was brilliant. Parthiv Patel, Shubman Gill as am sure the rest of the team too singled out and credited Dravid for his contribution. The respect Dravid commands amongst the boys is evident. Yet they were free enough to intentionally and spontaneously photobomb their coach as he was on camera and create a bit of a ‘celebratory ruckus’ for a little bit. For me, it separated fear and respect where maybe fear does not have to be a prime element in order to be respected. Would love to hear from you. What were elements and aspects of the U19 win that touched a chord with you and what maybe lessons that we as a country and the corporate sector may want to mull on and action, from this fabulous experience these young boys have created for us! Pearl D’Souza is a Director at PrePearl Training Development Pvt Ltd. If you are looking to explore the science and the ‘how’ of teamwork, join Pearl at the Belbin Masterclass. So happy to present this month a webinar that explores what truly makes development journeys successful and impactful. We had the wonderful opportunity of working with Roopashree Shanker GM-Circle HRBP, at Vodafone UP west on their Women Development Journey. Vodafone is an organization with a keen focus on developing talent and building an internal leadership pipeline. Today’s challenging environment calls for a focus on enabling talent and leaders truly discover their strengths and build the ability to affect change positively. Behavioural change is a process that requires attention, effort and time. Roopashree is a GM-Circle HRBP, at Vodafone UP west. She has worked across geographies in India giving her a keen understanding and appreciation of different market realities, cultural nuances, and diversity in teams. Her forte lies in designing creative solutions, building supercharged teams, and developing people capabilities. She has partnered with business teams in Vodafone in creating success stories in a dynamic & competitive business environment, implementing change management projects, and leading teams to deliver superior results. She is passionate about traveling, reading and writing poetry. Pearl is a Director at PrePearl Training Development Pvt Ltd. Her forte lies in working with teams to harness resources and maximise potential. Her research papers and presentations have been part of national and international forums and conferences. Would be great if you can join us. Please do block your time. Date: 14th December 2017, Thursday. There are situations wherein as a manager, one may be required to make contributions that are not part of one’s preferred Team Roles. Eg: a situation where a senior colleague needs to be dealt with tact and sensitivity. If one’s top Team Roles are largely action roles, then behaving in a way that shows unilateral focus on the task with little or no regard for the sensitivity of the person will not be helpful. In such situations, a shift in Team Roles is needed. Adopting a manageable role will need a conscious sense of self-discipline. Keep in mind what is the outcome you need. Eg: in the above example, one may need the colleague to know that he is being listened to and getting his ‘buy in’ is crucial. Hence keeping this outcome in mind, one is better able to focus one’s attention and adopt the manageable Team Role that will enable this outcome. Be aware of the time period for which you need to play the role so that you are aware that it is manageable and don’t get worked up. Playing a manageable role can be stressful because it requires conscious effort. Being aware that some discomfort is part of this exercise and that you are making the TR contributions for a limited time, can help one focus on giving one’s best and effectively manage the accompanying stress. Ask another for feedback. This is crucial. Ask your team members to give you feedback on how you played your manageable role. This will go a long way in you polishing the contributions you can make whenever you have to adopt your manageable role. Since team members are aware that you are playing a manageable role, there is also openness in providing feedback. Asking others for feedback also encourages others to make conscious efforts to polish their own Team Roles. We would love to hear your thoughts on playing one’s Manageable role effectively. Do send in your comments below. As leaders and managers, a competency that is gaining critical importance is the ability to give and receive feedback. Employees need to know whether their performance is in line with the expectations of the manager. For long, this competency has focused on the past and for good measure on what has already occurred. Little or no time is spent on the possibilities about the future in the execution of the task. If we have to review performance and measure it in comparison to the expectations set by the manager, he/she must develop the capability of communicating expectations and suggestions to aid future possibilities. Marshall Goldsmith uses the word “Feedforward” for this valuable technique. There is no doubt that feedback is important. But feedforward must precede feedback for effective individual or team performance. Here are a few suggestions to leverage your Belbin team roles for giving Feedforward. Plant: As a Plant, you are creative and bring a refreshing angle to doing things. You have the ability to come up with recommendations and suggestions on how to approach a challenging role or task ahead. Feedforward from a Plant can bring exciting new dimensions to the goal and can stimulate the energies of your employee to commit and achieve the goal. Monitor Evaluator: As a Monitor Evaluator you are logical, discriminating and you naturally weigh all options before making a suggestion. This is an important ability to examine future expectations, identify the reasons for the success of a particular path and when the same is verbalised, it can help in reassuring the employee about the anticipated success of the rightness of the direction ahead. This encourages the person to commit more fully to the goal. Resource Investigator: As a Resource Investigator, you have the unique ability to inquire and explore possibilities into the future. You can engage the employee enthusiastically and bring optimism and a “can do” approach to the goal. Resource Investigators have a natural way to tap into resources both within and outside the organization to achieve a task. You can provide valuable feedforward suggestions in this direction to help the goal achievement. Shapers: As a shaper, you instinctively push for action. Feedforward suggestions made by you are often taken seriously. When you use this inherent strength in the feedforward process you are listened to because you are known to be on the top of things. The valuable contribution in the feedforward process that you bring in is your ability to make the “difficult things to say” easy. TeamWorker: As a Teamworker, you are blessed with this unique ability to perceive and be sensitive to what help is needed. You are naturally attuned to the feedforward process and offer suggestions that will be of help. The good news is that the way you put your suggestions forward is non-threatening and keeps a window of opportunity open to fall back on you when needed. Implementer: As an Implementer, your ability to organize your thoughts in a cause-effect sequence is a unique strength that you bring to the feedforward process. The suggestions made by you are often practical and the expected outcomes visible. This stimulates confidence and there are less chances of going wrong. Most importantly your commitment and disciplined approach brings in respectability and a “must try” attitude to your feedforward. Completer Finisher: Your reputation for perfection brings to the feedforward process the hope that what you suggest can “polish and perfect” the desired outcome. Your sense of urgency can bring to the forefront the best approach even for the last mile. In conclusion, try to engage yourself and your team in this process. The diversity of inputs from team members leveraging their top Belbin team role behaviours not only enhances the quality of inputs but also goes a long way to deliver the best possible outcome. India is at an interesting place today wherein we are called to create and nurture the future. The New India is one that will need to leverage the strength of the vast millennial workforce and its diversity across the length and breadth of our country. The transportation industry is one that contributes to nation building and is currently the most progressive sector. In this webinar, we get into a conversation with Mrs. Poonam Chandok, HR Head L&T Transportation Infrastructure, to understand the people dimension in this industry, the initiatives that L&T Transportation has designed and how to create an impact. Poonam Chandok HR Head, L&T Transportation Infrastructure. has handled various HR functions like Organizational Development, Performance Management and Leadership Development among others; strategically aligning each HR initiative with business needs. Her expertise in strategic HR made her a part of the team that scripted the success story for L&T Transportation, enabling a CAGR of over 20% in the last four years and its foray into overseas market. Her true success lies in the impact she leaves on the people she works with. Important deliverable at hand? 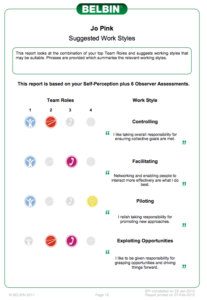 Have you checked out your Belbin Work Styles report yet? A few weeks ago, I had quite a “Eureka” experience during a one-on-one exclusive coaching session. Even at higher levels in this client organisation, the Development Center outcome is an important input in one’s career progression. Understandably, my coachee was nervous about the forthcoming Development Centre. My focus during coaching has been trying to help the coachee build an ‘Authentic Leadership’ style. Belbin has been an effective tool here, especially for ‘Conflict Resolution’ at personal, within team and intergroup levels. What excited me was the use of Belbin to help approach the Development Centre with confidence. Case Studies was what my coachee pointed out as being a part of the DC that he wasn’t excited about. In the past, ‘case studies’ was always something he believed he didn’t do very well at. We took an HBR case, this particular one called for competencies in Data Analysis, Decision Making and Achievement Orientation. I advised the coachee to visit his Belbin Workstyle report and internalize his four workstyles. We then spent time reflecting on his Belbin Work Style associated Mantras. Eg: “I like the challenge of digging for answers”. He began to see the case study in this light and realised he naturally had the ability to possibly do well and even enjoy a case study!. Believe me, the results were magical. Once he tapped into his self-belief and drew from his strengths his approach to the case study was novel, unique and most of all authentic! We also tried the approach in the ‘Role play’ exercise and the measure of confidence was as high and insightful. Subsequently, I tried the experiment on another coachee where his top four team roles were ME/PL/CO/RI. The results were again exciting. The second coachee used the workstyle report to prepare for his client project review presentation. He phoned me up a few days ago to share his excitement about the open appreciation he received from the client reviewing head. 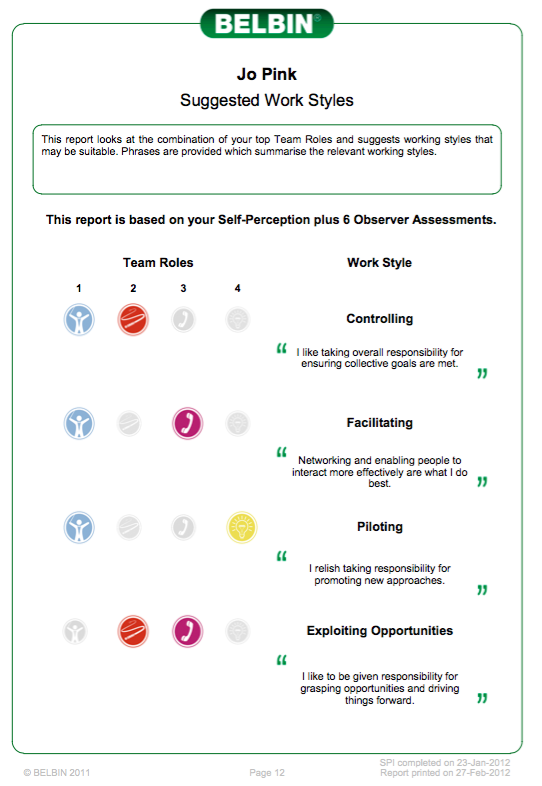 The Belbin Work Styles report does have great value and lends itself to creative leadership applications. Breakthrough performance by a project team demands close collaboration and teamwork. Teamwork that produces outstanding results is an art and skill wherein team members are able to design a working process wherein individual strengths are brought out and harnessed and weaknesses are managed. If the presence of the Team Role contributions is key to a team’s success, then enabling team members to make these contributions becomes the responsibility of every team member. Eg: A process step requires that activities are completed meticulously, in time and with perfection. For team member A who is a Completer Finisher (CF) to be able to contribute the above behaviours, it becomes important that he also gets support from the rest of the team. The team on their part then can make clear the nature of the priorities and the deadlines so that team member A is spending his energies on the aspects wherein the CF behaviour is required the most. Also keeping in mind that CFs always adhere to deadlines and with the added internal drive for perfection, it will truly enable team member A to function effectively if the team does not set unrealistic deadlines. How can one effectively deploy one’s manageable roles? As a manager, delegating effectively becomes an important skill. It is essential to choose well what to delegate and what to keep, so as to ensure a good output. It is important to delegate in a field where your strength is lacking- processes that require your least preferred roles. By elegating work associated with certain Team Roles, you can essentially give responsibility over those Team Roles to others, yet retaining the interactive relationship and communication. Team Roles) but is barely eligible. Eligibility refers to qualifications, past experience. If the person is barely eligible but highly suitable in terms of Team Roles, investing in bringing that person to the required level of functional knowledge is highly recommended. This raises commitment, engagement of person and effectiveness of end result.